Is there a better alternative to eClicker Presenter? Is eClicker Presenter really the best app in Teaching Tools category? Will eClicker Presenter work good on macOS 10.13.4? eClicker Presenter needs a review. Be the first to review this app and get the discussion started! eClicker Presenter is made up of two parts: the Presenter and the Audience. 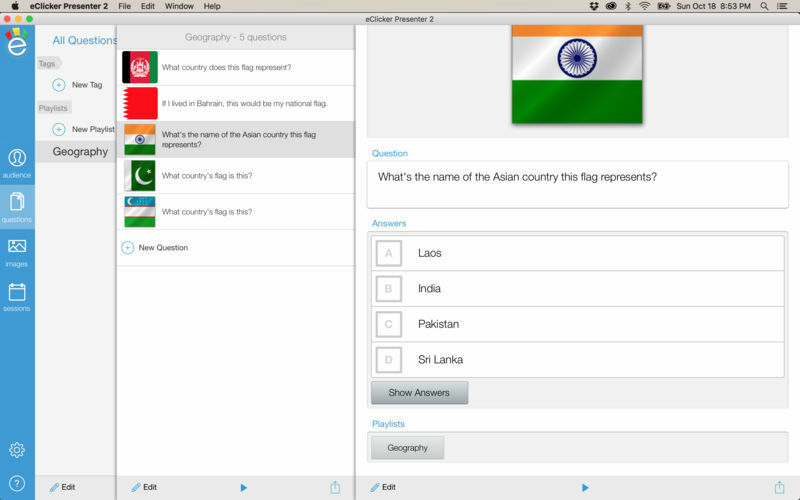 Teachers and presenters use the eClicker Presenter app to enter questions and begin the polling. Participants use the free eClicker Audience app, or their device's web browser, to view and answer the questions, right on their smartphone, tablet, or laptop. eClicker Presenter for Mac handles at least 128 audience devices and of course, you get to use a "real" keyboard. eClicker Audience for iOS handles at least 64 participants on an iPad and 32 on an iPhone or iPod Touch.